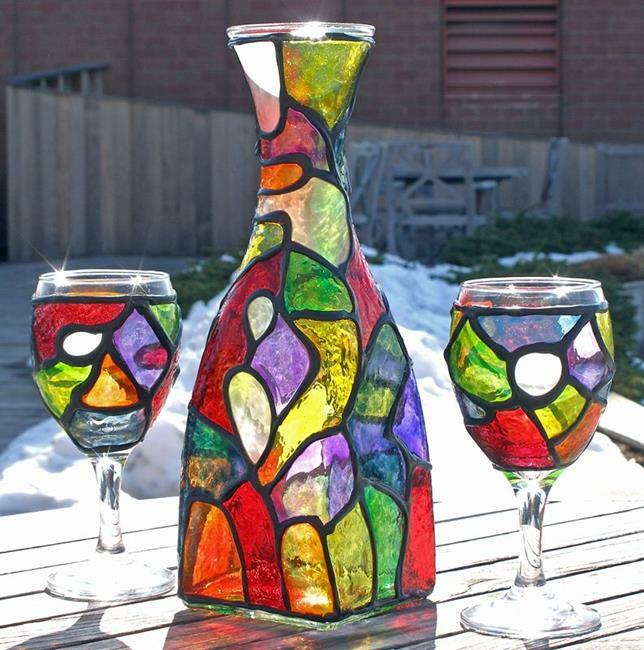 This colorful wine decanter set features stunning, gem-like colors in jewel tones that have a beautiful translucency to them. I would consider this stained glass painting method "cold" glass work. 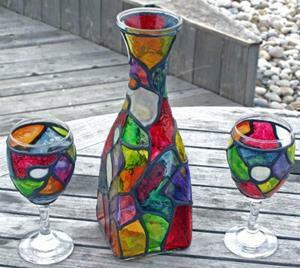 I wanted this set to be eye-catching, attention-grabbing and something of a conversation starter in that would appeal to wine connoisseurs as well as just anyone that enjoys art and something to please the senses. Something that could easily be displayed in a curio cabinet or on a window sill or shelf. Toward that end, the decanter itself, has a very interesting and (in my humble opinion) elegant shape, flared and squared at the bottom, and narrowing in the center toward the top which is slightly flared out. It measures approx. 11"Hx4W" and the opening at the top is approx. 3". 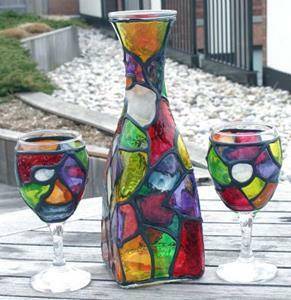 The 2 matching wine glasses are the standard size of a regular wine glass; (approx. 6.5"Hx3"W) each. The absract design here is SO colorful and looks quite different from differing angles, which I try to show as much as possible in the photos here, but it's nearly impossible to capture all the translucent beauty of the colors of the glass in photos. When the sunlight shines through the colors they cast gorgeous shadows onto whatever surface that they are placed upon. The first photo here best shows how the sunlight really animates the colors and makes them sparkle and glow with vibrancy...these colors really come alive in the sunlight! First, I lay down the black "liquid leading" outlines. Then after those are dry (overnight), I apply the colors to each individual section, meticulously with a toothpick(! ), using it to blend and spread the colors all the way to the edges of the black outlines, making sure to pop any bubbles that occur along the way. Then, when I am satisfied with all the color it is left to "cure" or dry for about a week.